Storms moving through North Texas Thursday morning are being blamed for delays to traffic, power outages and fires due to lightning strikes. 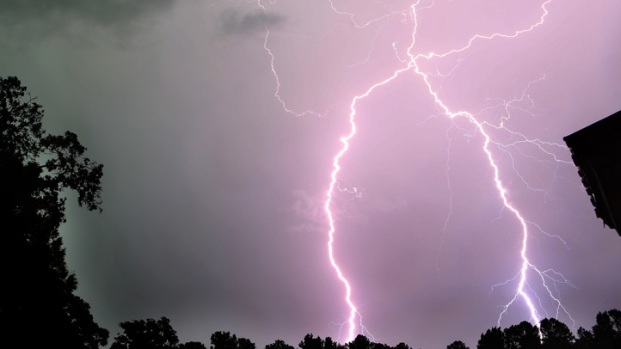 The storms are bringing strong electrical activity including over 5,000 cloud-to-ground lightning strikes between 3:30 a.m. and 4:30 a.m. Thursday, according to the National Weather Service in Fort Worth. The early-morning storm knocked out power to tens of thousands of Oncor customers, according to the power delivery service's online outage system. At 10:13 a.m., more than 16,000 North Texans were still without power during the height of the outages. In West Texas, winds of 82 mph were recorded in Lubbock where part of the roof of the Lubbock Heart Hospital was ripped off. In Friona, there were reports of baseball-sized hail. 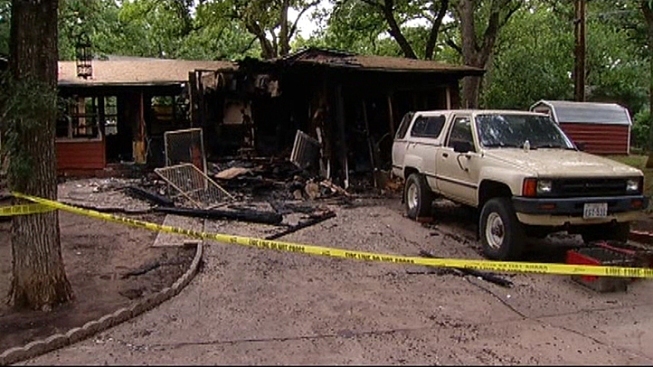 Firefighters say a home in Fort Worth is a "total loss" after lightning struck the house. At 9 a.m., most of the major storm activity has pushed east of Dallas-Fort Worth into East Texas. See the latest weather maps and radars here. Fort Worth dispatchers confirmed two homes in the city were struck by lightning early Thursday morning, causing them to catch fire. Lightning strikes from a storm system that rolled through North Texas sparked multiple incidents, including an apartment fire and house damage. Lightning struck a home in the 5300 block of Lambeth Lane, just west of East Loop 820 near Meadowbrook Drive, at about 3:30 a.m. Thursday. The family there says they awoke to a loud boom which set off the security alarm. 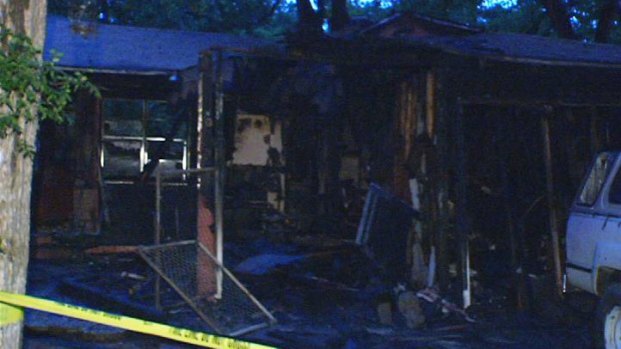 The homeowner called a neighbor for help, who discovered that her house was on fire. "I was just going to come over and help turn the alarm off, I looked out the window and it was just engulfed," said Michael Lansing. "The whole back of the house was just engulfed, it was unbelievable. I've never seen it travel that fast." The homeowner was able to get out safely, along with one of her dogs. A second dog had to be pulled out by a Fort Worth firefighter. That firefighter was bitten on the hand, but was treated and released. The homeowner's daughter says Lansing helped save her mother's life. "It was scary," Lansing said. "It was sad for her she's lost so much, what a drag. It's tough." Fort Worth fire officials said a home on Yuchi Court in Fort Worth suffered even more damage and is "a total loss" after a lightning strike. "There's no repairing this one," said Lt. Carol Jones, spokesperson for the Fort Worth Fire Department. The homeowner told NBC 5's Jeff Smith that she heard a loud boom and found a bedroom in her home was on fire. No one was injured in the fire. An apartment complex in the 1600 block of Weyland Drive in North Richland Hills caught fire after being struck by lightning, NBC 5 has learned. One unit was damaged by fire and another three by water. A 23-year-old resident was hospitalized for smoke inhalation as a precaution. Finally, an early-morning house fire in Colleyville, on the 3500 block of Fox Meadow Drive, may also be attributed to lighting, though officials have not yet made an official ruling on the cause of the fire. Heavy rains could cause street flooding on some roads. Weather conditions also contributed to a early morning traffic incident where a 18-wheeler jackknifed on the northbound lanes of Interstate 35W. Fort Worth police used the shoulder to let traffic get by, but heavy congestion and no detour to divert traffic in the area caused a significant backup. The scene was cleared around 4:20 a.m. Dealing with a power outage? You can still get information from NBC 5 by using your phone to follow us on Twitter (@NBCDFW) or by grabbing our News or Weather apps for iPhone, Android, and iPad. NBC 5's Keaton Fox, Jeff Smith and Chris Van Horne contributed to this report.